J-ust M-e: In the dark and all alone. night, he is a MAN. The boy is naturally terrified... He can hear all kinds of noises. Wild beasts must surely be all around him. Maybe even some human might do him harm. The wind blew the grass and earth, and shook his stump, but he sat stoically, never removing the blindfold. It would be the only way he could become a man! Finally, after a horrific night the sun appeared and he removed his blindfold. 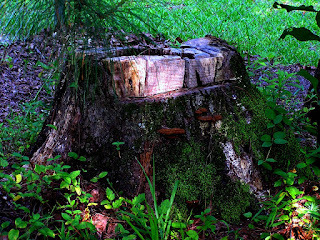 It was then that he discovered his father sitting on the stump next to him. He had been at watch the entire night, protecting his son from harm. We, too, are never alone. Even when we don't know it, God is watching over us, sitting on the stump beside us. When trouble comes, all we have to do is reach out to Him. Moral of the story: Just because you can't see God, doesn't mean He is not there. I have felt just like this Cherokee boy. I've been all alone, in the dark, not able to see what lays just beyond my reach. I have sat, scared (terrified) of what is about to happen to me. I have cried tears of pain at being left alone to defend myself against my fears. I have wanted to be rescued. But, I wasn't really alone. I have never been alone. Even in my darkest hours, God was there. Did I feel his presence? No. But that doesn't mean he wasn't there with me. Just like this Cherokee boy who couldn't see, we can't see everything either, even though our eyes are open.